I’ve used Cyber-Dojo to demonstrate two different approaches so you can follow along with my example, but I recommend you try this kata on your own before reading further. [The link is to Cyber-Dojo’s dashboard view where you can see every change made in the source code by two different teams – Gorilla and Moose]. The code is now screaming for us to refactor it, but to keep all the tests passing most people try to solve the entire problem at once. That’s hard, because we’ll need to cope with multiple lines, varying indentation, and repeated characters with a varying number of spaces between them. And now, in subsequent rewrites of the same test, we can address indentation, then inter-character spaces and finally the symmetry of the bottom half of the diamond. You can follow along in the Cyber-Dojo dashboard. By recycling the second test multiple times, each time modifying the expected output to become closer to what we actual want, we’ve allowed ourselves to be guided gradually to a solution. When working on user stories, I often encourage teams to deliver low-fidelity slices early, and this is a similar strategy, but applied at a lower level. 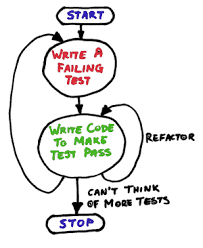 It won’t work in all cases, but if you find that the next refactor is harder than you’d like, think about trying to get there in smaller steps. An independent software developer, trainer and consultant based in the UK. He specialises in working with teams adopting and refining their agile practices, with a particular focus on delivering software through the use of examples. Hmm… I like it! The Moose approach looks like a good fit for those times when its hard to see an immediate step between the hardcoded answer and the final answer.